See the features of our web-based Electronic Health Record. BackChart®'s Chiropractic Office Solution allows you and your staff to handle all the core aspects of your business from scheduling appointments to scrubbing bills. Not only is BackChart® COS bursting with valuable features, but it’s also the most reliable, affordable, user-friendly, and patient-driven EHR on the market. 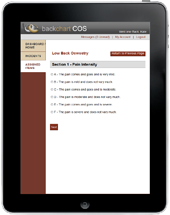 Our web-based Patient Charting helps you see more patients by simplifying your ability to create quality patient notes. Our focus is to help you create excellent documentation. You can store old patient records, create customized templates, use voice recognition software, reuse text from a previous note, import from Microsoft Word, organize notes by incident, track quality-of-care measures, export patient reports, create medical alerts, establish progress exam alerts, select the correct date, create addendums, mark as a review request, digitally sign notes, and more. Our web-based Billing Queue helps you have better quality assurance as you’re able review the doctors’ work before submitting to Kareo for billing. Our focus is to help you ensure proper data collection. You can run a billing report that shows a list of patients and their status to be billed. You can click on the patient’s billing status to add or subtract procedure codes, modify diagnostic codes, change patient demographics, and/or amend the patient report. You can assign pricing to the procedure codes by creating different insurance types. Lastly, you can print the bill and mark billed to submit to Kareo. Our web-based Patient Portal helps your office save time and enjoy greater convenience by collecting necessary patient demographics and quality-of-care measures. Our focus is to help you optimize your practice. Every patient is emailed portal access. On their portal they can view their next appointment, check their medications list, allergies list, problems list, and labs. Reception staff is also able to log into the portal and check patients in using an iPad, tablet or computer. On a device, each patient will then be able to update their demographics and complete assigned surveys before being seen by the Doctor. Our web-based Clinical Workflow™ helps you save time and stay compliant by streamlining all the day-to-day tasks of your office. Our focus is the help you keep up with quality assurance measures & make better clinical decisions. Our diagnostic imaging tool will help you take necessary imaging to minimize your work & maximize your payment. Our My EHR home screen helps doctors review unsigned reports, review requests, see appointments without reports, view portal events, store documents, and track meaningful use. Our instant messenger will help you communicate real-time with other office staff. Our web-based Meaningful Use application will easily help you qualify for up to $44,000 of government incentives! Our focus is to help you remain progressive with health care reform, for we are completely certified through the ONC-ATCB. Our Meaningful Use Report is designed to help you easily & thoroughly complete all Meaningful Use Items. Meaningful Use items are built directly into our Clinical Workflow to help you streamline the collect of data. Our report is extremely transparent so you can easily find & record patient data you missed. Our web-based Reports will help you follow up with patients and market your business by easily tracking patient information. Our focus is to help you build your business to new levels of success. Our reports include a Billing Summary Report, CAHPS Survey Report, Daily Visit Report, Meaningful Use Report, Open Incident Report, Patient Lists Report, Visit Summary Report, Word Count Reports, and more.